John Walter III inherited the Bearwood Estate from his father, and with increasing wealth from his Proprietorship of 'The Times' and the printing works. He expanded the estate well beyond Bearwood to Wokingham and Finchampstead, where a sawmill and brickworks was sited on what is now known as Kiln Ride. He replaced the house at Bearwood with a mansion, which took from 1865 to 1874 to build, using Bearwood bricks. DEATH OF MR. WALTER, OF BEARWOOD. 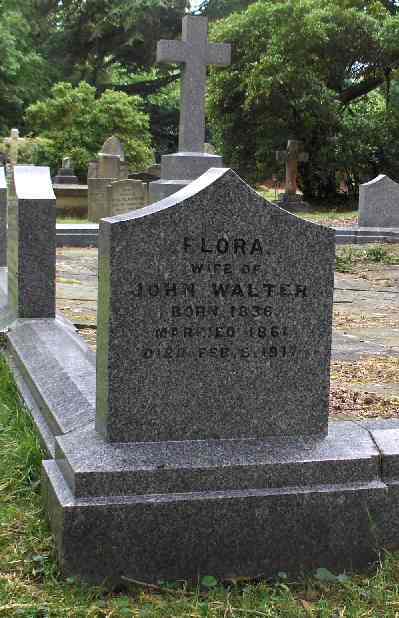 We record with profound regret the death , after a very bad illness, of Mr. John Walter, J.P., D.L., the principal proprietor of The Times, which melancholy event took place on Saturday last, at his residence, Bearwood, Wokingham. Mr. Walter had been in fairly good health, and no serious symptoms manifested themselves until the 24th ult., when – while at his town residence – what was thought to be a rash appeared. His physician, Dr. Venning, was immediately sent for, and at once diagnosing the disease, ordered the patient’s removal to bed at Bearwood. The complaint – purpera haemorrhagica – ran its fatal course, in spite of the skilled and incessant attention of Dr. Venning and Mr. Barford of Wokingham, and Mr. Walter succumbed to blood poisoning, which is the final stage of the disease, about one o’clock on Saturday, Mrs. Walter and other members of the family being present. Deep is the sympathy expressed on all sides with Mrs. Walter and the family in their irreparable loss. Mr. Walter (who only last month completed his 76th year) held many important offices, which he discharged with singular fidelity and fair-mindedness, his one aim and object, throughout his long public career, being the welfare of his country, and of his native county. He was a man of sterling worth, whose religion was shown in his consistent daily life, a staunch Churchman, a sound and shrewd politician, a ripe classical scholar, a deep student of history, ancient and contemporary, - and, perhaps above all, a perfect model of the true English gentleman. Although he wore a somewhat austere expression, he was kind and considerate, and unostentatious in every relation of life, and amid his multifarious occupations, he ever found time to consider the affairs of the poorest of his servants and neighbours, who asked his advice or claimed his sympathy, and his wide-spread private benevolence will be sorely missed. County life always had a great and special charm for him, and he was never happier than when engaged in improving his beautiful estate. Arboriculture, agriculture, and horticulture, alike claimed his attention, and in his practical acquaintance with all he excelled. In the agricultural world Mr. Walter’s Devon and Shorthorn herds were for many years noted for the care bestowed on them, and high local prizes were awarded to the roots grown on his home farm at the principal shows. Passing on to more important matters – though not perhaps so near and dear to the hearts of his neighbours and tenants, who were all valued friends, and who are now mourning his loss, Mr. Walter was High Steward of Wokingham, a Governor of Wellington College, a Member of Parliament for Berks from 1859 till 1865, and again from 1868 till 1885, when he retired; an active member of the Court of Quarter Sessions, and from its constitution an Alderman of the Berks County Council, and, also from the beginning, a highly valued lay member of the Oxford Diocesan Conference. He sat for the Borough of Nottingham from 1847-58. In all and several of his many public capacities he "gave of his best". Wherever he spoke politically he showed himself a sound and consistent Liberal of the old school, an advocate of true and beneficent progress, and a staunch and broad minded Englishman. It may be said without the least fear of contradiction that even in the trying times of the famous "Parnell Commission", as in the steps which led up to it, Mr. Walter had implicit faith in the cause which he so boldly, and at such great stress of physical and financial endurance, championed. He was a weighty speaker, always listened to in the House of Commons; and at the Diocesan Conferences, and elsewhere, his words were almost law. Although a little ponderous at times, he had a finished oratorical style, but his speeches were mainly regarded for the high sentiment which inspired his every utterance, and the shrewd and original line of thought which he constantly showed on questions of importance. Mr. Walter (the eldest son of Mr. John Walter, of Bearwood, M.P. for Berkshire 1832-7), was born on October 8th 1818, was educated at Eton and Exeter College, Oxford, and graduated B.A., took 2nd class in classics 1840, and proceeded to M.A., 1843. He was called to the bar at Lincoln’s Inn 48 years ago. The deceased gentleman always had a special affection for the town of Wokingham, for Wellington College, and for the Finchampstead district. His services on the Council of the great military school have more than once been borne testimony to by the Price of Wales, the Commander-in-Chief, and others of his co-Governors. At Wokingham his memory will never fade, among the many memorials of his munificent generosity being the building and endowment of the beautiful Church and Vicarage of St. Paul’s, and its schools, the building of the new parish rooms and offices, with handsome clocktower, standing at the corner of the Station-road, &c.
As a husband and a father, Mr. Walter could not be excelled. He was twice married, his first wife being Emily Frances, daughter of Major Court, of Castlemane, Twyford, and his second (the present Mrs. Walter), Miss Flora Macnabb, daughter of Mr. J. M. Macnabb, J.P. The sad death of his eldest son (Mr. J. B. Walter) while skating on the lake at Bearwood on Christmas Eve, 1870, - two days after his return from "The Grand tour" – was a severe blow to him. Mr. Walter is succeeded by his eldest surviving son, Mr. Arthur Fraser Walter, J. P., Major in the 1st Vol. Batt. Royal Berkshire Regiment, and for several years past the acting partner in The Times. "Mr. Walter’s artistic tastes were not less strongly developed than his aptitude for business and public affairs. He was fond of landscape gardening on a large scale, as the grounds of Bearwood, first laid out by his father and constantly beautified by himself, and the avenue of Wellingtonias, planted near Wellington College, abundantly testify. Of that college Mr. Walter was a Governor, and he founded there, in honour of the hero whose memory he almost worshipped, an annual prize for the best English essay on Wellington’s despatches, which he well-nigh knew by heart. In 1859 he generously assisted his brother, Sir Edward Walter, who survives him, in starting the Corps of Commissionaires. Mr. Walter was a fine judge of pictures, a judicious buyer, and a regular visitor to the exhibitions and the principal sales. His own gallery, partly collected by his father, is an assemblage of masterpieces; and he thoroughly enjoyed discussing its beauties with visitors who had studied the Dutch school. The best of these pictures he lent, some of them more than once, to the winter exhibition of the Royal Academy. He was a life member of the Royal Agricultural Society of England, and had been since 1879 a vice-president of the Smithfield Club, of which, in 1882, he was president". "For good or for evil, Mr. Walter’s influence on the history of his time has been powerful. His record is that of a conscientious servant of the public, a sagacious man of affairs, a faithful steward of his talents and opportunities, a devout Christian, a sincere patriot, a high-minded English gentleman." The death of Mr. Walter, of Bearwood, has cast a sad gloom over the entire parish of Finchampstead, where "the Squire", as he was generally called, was a large employer of labour, and much beloved by the people. Mr. Walter built the school-house and schools, kept them in order, and contributed annually in the most liberal manner to their support. In the absence of the Rector through indisposition, the Rev. P. H. Ditchfield, Rector of Barkham, officiated at the Parish Church of Finchampstead on Sunday evening, and made a very touching reference to Mr. Walter’s death, as may be seen from an extract of his sermon given below. Muffled peals were rung after morning service and again in the evening. We in this place have just lost one who was well known to all here, one who will be sorely missed, and who was honoured and respected by all whose privilege it was to know him. The squire of this parish, Mr. Walter, has suddenly been called to his rest, and wherever one goes, amongst rich people or poor people, amongst the educated and the learned, or amongst the humble cottagers, one hears nothing but the language of universal lamentation and regret on account of his sudden decease. A fortnight ago he was reading (as was his wont) the Lessons of Holy Scripture in Bearwood Church, and to-day his body rests awaiting the last sad scene by the grave-side. It is all very sad, very distressing for those dear ones left behind, and your hearts will go out in sympathy for the mourners, for his affectionate wife, for his children, who are now pressed down with overmuch sorrow. We, too, can sympathise with them; we have lost a true friend, as you all know too well. Mr. Walter was a man of large heart and wide sympathies. You are aware that he always took a keen interest in public affairs, and in the conduct of the world’s chief newspaper, which was mainly his property. In all the vexed questions of political life amid all the ebbs and flows of popular opinion, in all the exciting problems of the day, religious, social, economic, as well as political, Mr. Walter ever had deep rooted opinions, which guided the conduct of his newspaper and helped to mould and fashion the judgments and opinions of the world. And yet amidst all their cares and anxieties which such a position entailed, Mr. Walter used invariably to take a personal interest in the affairs of the parishes included in his estate. As you are aware, he rebuilt at great cost the chancel of Barkham Church, and not only that, he took a personal interest in the welfare of the poor who laboured for him, and did his utmost to provide good and sanitary dwellings for them, performing many acts of pure and personal kindness which will long endear his memory. Truly a good and great man has passed away. It is not for me now to tell his history or recount his virtues; but at least we may learn this – to feel a real sympathy for others in whatever state of life we may be placed. We hear much in these days of the severing of class from class, the bitterness which is supposed to exist between squires and peasants, and many foolish things are said by ignorant demagogues on this subject, I cannot believe that what such men say is true. It has not been our experience in this neighbourhood. Every one knows that in Mr. Walter they have lost a true friend, and while we mourn our loss caused by his death, and sorrow with his family, let us endeavour to extend that sympathy to others which he so keenly felt for us, and try to imitate the many virtues which his blameless life set forth. He was in every sense a religious man. Religion was to him a real personal guide and rule of life, and that is the secret of all greatness. Be religious men and women, let God direct your thoughts and actions, and you, too, will be great, in whatever condition of life you may be placed, whether in high estate or lowly born, you, too, will rest, when your labours are ended, safe in the hand of God. At the Wokingham Petty Sessions on Tuesday, before the commencement of the business, Sir William Farrer, the presiding magistrate, rose and said he wished to call the attention of his brother magistrates to an event which had caused them the deepest mourning, viz., the loss they had sustained in the death of Mr. Walter of Bearwood, a man of whom he need say but little in this neighbourhood; for if ever there was a centre and a man who could do good, that centre was this neighbourhood and Mr. Walter the man who applied all the means that lay in his power for the good of all around him; and from the beginning to the end of his life he devoted his energy, talents, and means to the fulfilment of his duty in every relationship of life. Mr. Walter’s memory would live long among them, and they would ever mourn his loss. With those few words he wished to move that a vote of condolence be sent to Mrs. Walter, Mr. Arthur Walter, and family in the loss they had sustained. Mr. H. G. A. Knox, in a few well-chosen words, seconded the resolution, remarking that he should say but very little with reference to the sad event, because he should probably have an opportunity, at the meeting of the Wokingham Board of Guardians next week, of speaking to his brother members on the death of Mr. Walter. There was a deep and an extra sorrow on his part in the death of their brother magistrate, inasmuch as Mr. Walter was a relation of his and had been closely associated with him on the County Council and at his own house. He was sure that his death would be a great loss to the county, and in his memory would long be remembered and cherished in this and the adjoining neighbourhood. 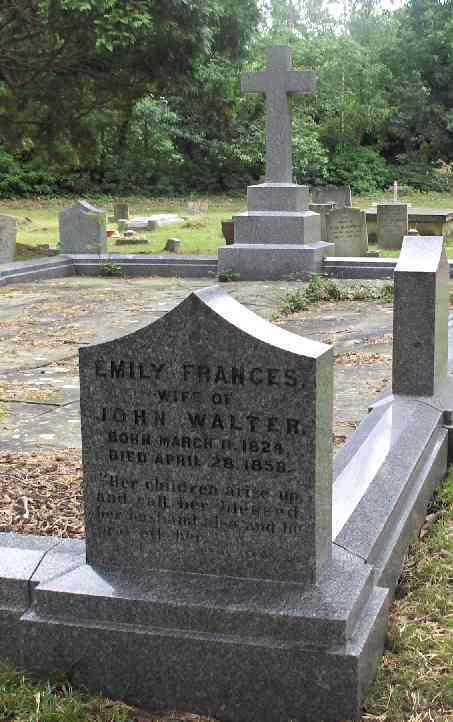 "That a vote of cordial sympathy be offered by the Wokingham Bench of Magistrates to Mrs. Walter, to Mr. Arthur F. Walter, and to the other members of the family on the lamented death of Mr. John Walter, the senior Magistrate in the Forest Division of Berks, who during the long space of 53 years has acted as a Justice of Peace on this Bench. While offering this vote they desire to express their deep appreciation of the many great services Mr. Walter has during the continuance of a long life steadily rendered, not only to this Bench but to the whole neighbourhood." The Clerk (Mr. Frankum) was requested to send a copy of the resolution to Mr. Walter’s family. and that of the more hopeful Christian have we no continuing city, but we seek one to find a melancholy significance, and, with the numerous wreaths which had come or were arriving from friends, were a forcible reminder of death". The funeral cortège left the house at noon. A special train of 12 coaches, under the charge of Mr. Waddon, the district superintendent, left Waterloo for Wokingham at 10.3 a.m., conveying about 140 gentlemen connected with The Times, and from many quarters came a numerous company. The county of Berks was represented by Lord Wantage (the Lord Lieutenant), Sir Anthony Cope (Bramshill), Mr. T. C. Garth, M.F.H., the Archdeacon of Berks; the county members, Sir George Russell, Mr. W. G. Mount, and Mr. Philip Wroughton; and among those also present were Colonel Gray, Mr. J. A. Wiggett, Mr. T. R. Harman, Mr. S. S. Melville, Mr. A. A. Weston, Colonel Peat, Sir Arthur D. Hayter, M.P., Mr. R. G. C. Mowbray, M.P., Mr. A. F. Jeffreys, M.P., the Rev. Canon Garry (Reading), the Hon. and Rev. Randal Parsons, Admiral Adeane, Mr. Wilfred Smith (Grenadier Guards), Sir William Farrer, Mr. Farrer, Dr. Nicolson (Broadmoor), Colonel Blandy, Mr. John Simonds, the Rev. Austen Leigh, Mr. Pembroke Stephens, Q.C., the Rev. A. Carr (Wokingham), General Rickman and Captain Rickman, Mr. John R. Dasent, Colonel Lonsdale Hale, Captain Wheble, Major Wheble, Colonel Sir Frederick Carden, Mr. W. H. Dunn, the Master of Wellington College (the Rev. B. Pollock), the Rev. P. H. Kempthorne, the Rev. E. Davenport, and Mr. M. Forster (representing the College, of which Mr. Walter was a governor), Mr. A. C. Cobham, Mr. W. H. Dunn [also see above], Mr. H. B. Blandy, Mr. F. C. C. Barnett, Mr. Thomas Porter, Mr. W. W. Cowslade, the Rev. E. A. Gray, Mr. H. G. A. Knox, Capt. Thompson, Mr. O. C. Maurice, Mr. M. H. Sutton, Mr. Percy E. Crutchley, Mr. C. Franklin Simmons, Mr. Jos. Soames, Mr. G. F. Jones, Rev. J. W. Spurling, Mr. T. W. T. Cooke, Mr. Ernest and Mr. Reginald Simmons, Sergt.-Major Somerville (representing the Corps of Commissionaires), Mr. J. A. Hawkins (Sindlesham), Mr. E. M. Sturges, Mr. A. Barford (medical attendant), Mr. D. J. Cook (Reading), Mr. Charles Awdry (representing Messrs. W. H. Smith and Sons), Mr. Edward Dicey, C.B., Sir D. M. Wallace, Colonel Athorpe, Major Reid, Mr. Bearne, the Rev. Dr. Wace, Mr. Ffennell, Mr. Moberly Bell, Mr. J. R. Capper, Mr. A. B. Kelly, M. de Blowitz (Paris), Mr. Chirol, Mr. A. L. Shand, Mr. E. D. J. Wilson, Mr. J. Callendar Ross, Mr. Monypeny, Mr. A. A. Brodribb, Mr. Fuller Maitland, Mr. Chivers, Mr. Humphrey Ward, Mr. Thursfield, Mr. Soames, Mr. G. Farewell Jones, Mr. Fenton, Mr. Thompson Cooper, Mr. Foster Cooke, Mr. W. Storr, Mr. Eyre Thompson, Mr. J. Bune, Mr. Walter Scott, Mr. Hawkins, Mr. Nisbet, Mr. C. Marsh Denison, Mr. Hanson, Mr. Dalton, Mr. A. Tucker, Mr. W. T. Perkins, Mr. J. Bell, Mr. G. E. Wright, Mr. Pitt, Mr. H. H. Fyfe, Mr. Tahourdin, Mr. R. Hield, Mr. Kilbourn, Mr. C. H. Smith, Mr. Maddick, Mr. Plumbridge, Mr. W. Stephenson, Mr. Ireton, Mr. Ackrill, Mr. Marriott, Mr. W. Mundy, Mr. S. Beall, &c. Mr. G. J. Cowburn represented the Berkshire Friendly Society, of which Mr. Walter was one of the founders and a trustee. Many gentlemen from the neighbourhood were prevented from attending on account of the opening of the Assizes at Reading. Mr. Buckle (the editor of The Times) and Mr. Leonard Courtney, M.P., were prevented from attending by illness. Sir George Dasent, D. W. H. Russell, and Mr. Brudenell Carter also expressed their regret at being unable to attend. The sad procession left the mansion at 12 noon, and arrived at St. Catherine’s Church exactly at 12.15, the coffin being wheeled by labourers on the estate, on a simple bier. This was preceded by the employés on the estate, and followed by the Mayor and Corporation of Wokingham, the mourners, the Times staff, and the tenantry, &c. On approaching the church those preceding the coffin opened out, and the procession passed through into the sacred edifice, which was filled in every part. The mourners were – Mr. Arthur Fraser Walter, Major Frederick Walter, the Rev. Henry Walter (Rector of Bearwood), Mr. Francis Walter, Mr. Godfrey Walter, Mr. Hubert Walter, and Mr. Ralph Walter, sons; the Rev. F. Barham and Mr. Frederick Heygate, sons-in-law; Mr. John Walter, Mr. Robert Walter, Mr. Stephen Walter, and Mr. Elwyn Walter, grandsons; Mr. John Henry Walter and Mr. Thomas Charlton, nephews; Mr. James Macnabb and Sir Donald Macnabb, brothers-in-law; Mr. Henry Knox, cousin; and Mr. Geoffrey Charlton, great nephew. After them came Mr. George Luker and Mr. C. Cowie, old servants of Mr. Walter. Sir Edward Walter, Mr. Walter’s brother, was prevented, by slight indisposition, from attending. Mr. Deacon, clerk of the works, Mr. Tingey (assistant clerk of the works), Mr. Kemp (chief forester), Mr. J. Tegg (head gardener), were also among the mourners. The Mayor (Mr. W. B. Mower) and all the members of the Wokingham Corporation, with the Town Clerk (Mr, James May) were preceded by the mace (draped in crape), and the Mayor wore his chain of office (which was presented to the late Mayor by Mr. Walter, as the result of a subscription to which he largely contributed). Mr. Henry Simmons, the steward, was unable to join in the procession, he having, as churchwarden, the charge of the seating arrangements, which he carried out admirably. A number of the resident gentry and tenants lined the path on each side, and several of the under-gardeners on the estate followed the procession, bearing the wreaths which could not be placed on the coffin. At the west porch the coffin was met by the officiating clergy, the Bishop of Reading (Dr. Randall), the Rev. J. T. Brown, vicar of St. Paul’s, Wokingham and rural dean, and the Rev. P.H. Ditchfield, rector of Barkham, who preceded it, the Bishop saying the opening sentences of the solemn service of the Church, until it was placed on the trestles near the chancel. The service was absolutely plain, and the only ornament in the church was the collection of white flowers on the Holy Table. The Rev. J. T. Brown read the lesson, and the hymn, "Peace, perfect peace," (537 A. and M.) was sung with great feeling by the crowded congregation. Miss Jeacock, the organist, who had played some very appropriate voluntaries during the assembling of the congregation, softly rendered Mendelssohn’s beautiful air, "O rest in the Lord," as the body was borne out of the sacred building. 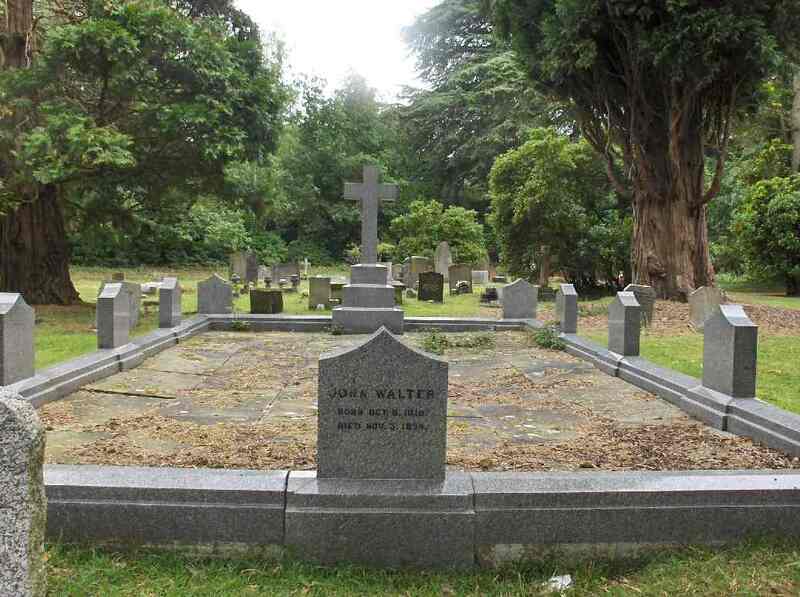 The interment took place in a plain earth grave, simply lined with moss, in the centre of the space on the south side of the church which was formerly the family vault, but which by the wish of the late Mr. Walter was recently filled in. In the family vault were interred the mother and father, the first wife, and the eldest son of the deceased. Mrs. Walter, Mrs. Arthur Walter, Mr. and Mrs. Heygate, Messrs. Philip, Godfrey, Hubert and Ralph Walter, Sir Edward and Lady Walter, Miss Laura Walter, Mr. and Mrs. McNeile; Mis Maud, Miss Rachel and Mr. Elwyn Walter; Mrs. Barham, Miss Fuller Maitland, Mr. and Mrs. J. H. Walter, Miss Constance Walter and Mrs. Holden, Sir Frederick and Lady Heygate, Miss Louisa Court, Mrs. Charlton, Miss Dora Charlton, Mr. and Mrs. Bearne, Mrs. Robert Smith, the Times Companionship, Mr. and Mrs. G. E. Buckle, Mr. and Mrs. Moberly Bell, Mr. and Mrs. J. B. Capper, "A few members of the Sub-Editorial Staff", Mr. Soames, M. de Blowitz and the Paris Staff of the Times, Dr. W. H. Russell, the Officers of the Corps of Commissionaires, T.R.H. Prince and Princess Christian of Schleswig-Holstein, the Duchess of Rutland, Eliza, Lady Dynevor, Lord and Lady Addington, Viscount and Viscountess Midleton, Mr. and Mrs. Murdoch, Sir Wm. and the Misses Farrer, Mr. and Mrs. Parker, Mr. and Mrs. Benyon, Sir John and Lady Shelley, Admiral and Lady Edith Adeane, Sir George Russell, M.P., and Lady Russell, the Mayor and Corporation of Wokingham, Bearwood Household, Under-Gardeners and Labourers of Bearwood, the Teachers and Scholars of Bearwood School, the Members of the Bearwood Institute, Bearwood Cricket Club, Mr, and Mrs. H. Simmons and family, Mr. and Mrs. Tegg, Mr. and Mrs. Luker, the Hon. . F. D. Smith, M.P., Sir Thomas and Lady Lucas, Mr. Garth and Mrs. Wedderburn, General and Mrs. Rickman, Sir Sidney and Lady Waterlow, Mr. Mount, M.P., and Mrs. Mount, Major and Mrs. Storer, Sir Francis and Lady Stapleton, Colonel and Mr. Gray, Mr. and Mrs. Simonds, Mr. and Mrs. Francis Ricardo, Mrs. Finch, Mr. Harman, Mr. and Mrs. M. Smith, Mr. Blagrave, Mrs. Wm. Cookson, Mr. Webb, Mr. Wetherall, the Dowager Lady Hunter and Miss Hunter, the Baroness Burdett Coutts and Mr. Burdett Coutts, M.P., Lady White and Mr. G. D. White, Mrs. J. E. Gladstone, and Miss Betty Gladstone, the Master of Wellington College, the Boys of Wellington College, Hon. and Rev. A. G. Campbell and Hon. Mrs. Campbell, Lieut., St. John, R.N., and Mr. George Maddick, Sir Arthur and Lady Hayter, Mrs. and Miss Pruyn, and the McMurray Royal Paper Mills. The entire funeral arrangements were entrusted to Messrs. Edward Morris and Co., of Reading, and were admirably carried out by Mr. Edward Morris and Mr. W. J. Stapley.